All of our Kratom is verified authentic by Wonderland-Labs, and we only choose the highest quality Kratom leaf and powder from verified sources. Nearly 2 decades in business, we have a wide variety of sources, and only the best sources make it through our strict screening process. 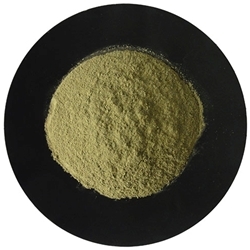 Why trust Green Malay Kratom powder from anywhere else? Our newest Green Malaya Kratom offering is said to last longer than our great selling Bali Kratom incense. Tested to be richer than our premium Bali leaf, this is equal in alkaloid content and purity of our Maeng Da strain. But don't equate Kratom varieties too much, each strain has its own character and hue. We find this premium Green Malay Kratom Incense to be uplifting yet gently relaxing, and is sure to please any Kratom lover, new or seasoned.